Indigenous women and girls are murdered or disappear from American cities in alarming numbers. But no one knows the true scope of the problem, because no one regularly reports the data. A new effort aims to spotlight both problems — the homicides of Native women, and the lack of data about their deaths and disappearances. At the U.S. Capitol, Sen. Lisa Murkowski wore purple Wednesday, because she said that was the favorite color of Ashley Johnson-Barr. 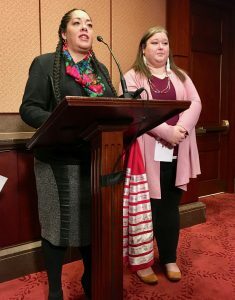 “Ashley was 10 years old when she was brutally, brutally murdered in Kotzebue, after being kidnapped,” Murkowski said at a press conference about missing and murdered indigenous women. Murkowski also spoke about Sophie Sergei, a student at the University of Alaska Fairbanks who was raped and murdered in a dormitory bathroom. “That has been a cold case now for some 25 years,” Murkowski said. Such stories never leave her, she said. But they do often drop out of the public record, or never make it into the record in the first place. Murkowski and Sen. Heidi Heitkamp, D-N.D., have sponsored a bill to improve federal data on Native American homicide victims and missing people. Heitkamp said information is the first step. “You will never solve a problem you won’t admit you have, that you don’t have data on, that you don’t have the ability to actually analyze,” said Heitkamp, who is in her final weeks in the Senate, having lost her re-election bid last week. The Urban Indian Health Institute highlights the lack of data in a new report. The institute, part of the Seattle Indian Health Board, contacted police departments in 71 cities, Orlando to Utqiaġvik, and asked for case information on all missing and murdered indigenous women going back to 1900. The report says 31 police departments, including the Alaska State Troopers, provided no data at all, or didn’t respond by the report deadline. (An AST spokeswoman said the agency provided data from recent years on Oct. 29.) The researchers also combed social and traditional media, and reached out to community members. Ultimately, they found 506 cases in the 71 cities. They say it’s a data snapshot. “First, I want to tell you, I had no federal funding for this. I financed most of it myself, through speaking fees I charge,” said Abigail Echo-Hawk, one of the report authors. She lives in Seattle now, but she’s originally from Fairbanks. The report singles out Anchorage police for excellence. The authors say the Anchorage Police Department saw the request for data as important, and got on it promptly. The department found 31 cases of missing or murdered Native women. And the hero of that statistical mission is Sgt. Slav Markiewicz of APD’s homicide unit. “I try to maintain good databases,” he said. Markiewicz has been devoted to those databases since he started in homicide in 2005, and he got help from detectives in culling back through the old files. “All the way to the 70s and it was difficult and we were afraid that it might not be completed but we tried to gather, to get all those cases listed,” he said. Markiewicz said when APD started the database there was resistance to collecting information on victim race. The police should be colorblind, the argument went, because all homicide victims are important. Markiewicz is retiring at the end of the year but said he’s confident his successor will keep up the devotion to good data collection.